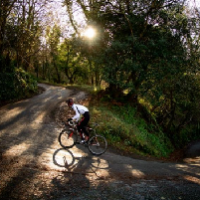 For those who enjoy riding outside and taking on the challenges of epic climbs, there is nothing quite so satisfying as a long climb broken up by switchbacks. The tight turns segment the challenging climb into bite-size, manageable pieces. If you were to ride two climbs of equal distance and grade—one that is fairly straight, the other with numerous switchbacks—the former would be mentally harder, and the latter would feel more doable. It’s not “easier” per se, but it’s less daunting and cyclists feel more of a sense of accomplishment. The same can be said for indoor cycling classes. Teaching switchbacks help your riders use visualization to motivate themselves through challenging climbs, and they make the class even more fun and engaging. They allow you to use the music in an empowering way. From a coaching standpoint, they give you the opportunity to include realistic outdoor scenarios in an authentic way, driving home the fact that what we do indoors is based on real riding outdoors (even if you or your riders don’t ride outside). In this two-part series on teaching switchbacks, I’ll give you tips on creating and cueing different kinds of hairpin turns in your indoor cycling classes. But first, what IS a switchback? I live in the Rocky Mountains and have ridden up many big climbs in the United States, Europe, and New Zealand over the past few decades; I just assumed everyone knew what switchbacks were. But over the years, I’ve seen instructors ask, “What is a switchback?” It made me realize that if you live where it’s flat and/or don’t ride outside, you may never have seen one, much less experienced one on a bike, and maybe not even in a car. A switchback is when the road doubles back on itself, also called a hairpin turn. In France, they are called lacets (pronounced “la-say”), which means shoelaces. 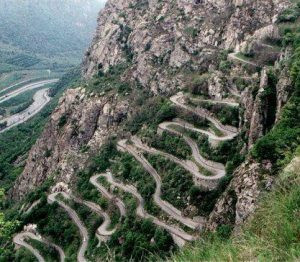 You can see how apropos that visual is when looking at Alpe d’Huez or the Lacets de Montvernier (photo below). 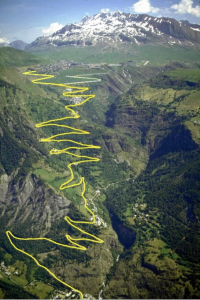 Alpe d’Huez is one of the most iconic examples of a multi-switchback climb. There are 21 lacets, each one numbered in descending order from bottom to top. Alpe d’Huez pales in comparison to the Passo dello Stelvio in the Italian Alps, one of THE most mythical climbs in Europe. 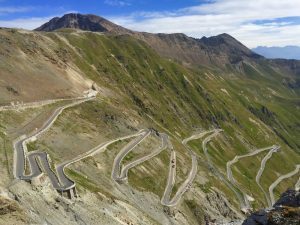 Stelvio has 48 switchbacks! The photo below is just a few of the final switchbacks taken from the summit of the climb. I had the joy of being able to climb this mountain (long on my bucket list) this past summer and I can tell you that the switchbacks—along with the stunning beauty—made it slightly less daunting. I have to add that my years of honing mental strength skills in my indoor cycling classes played a huge role in getting to the top…it was not easy and took me 2 hours and 42 minutes. 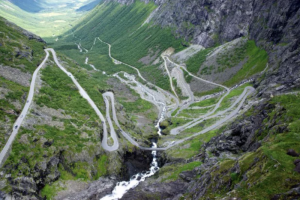 There are far more switchbacks in Europe than we have here in the United States. This is because many roads follow the same old foot and cart paths created centuries ago to access ancient mountaintop villages or to cross into neighboring regions or countries. Some of the major sinewy passes in the French, Swiss, and Italian Alps follow the route of Hannibal and his famous elephants from over 2,000 years ago. This includes the famous St. Bernard Pass from Switzerland into Italy. I live in the mountains of Colorado…you just don’t find that many villages high up on mountaintops like you do in Europe! Take the Lacets de Montvernier in the upper photo; there are two other main roads that can access that same village. It’s pretty amazing that there is a little-used, paved road like this to reach it. It’s just not a common sight in many countries; as you can imagine, roads like these are very expensive to build. Engineers in the United States found ways to build roads through mountains by using valleys and more gentle turns. There is one pass not too far away from me (Cottonwood Pass) that has a few European-style hairpin switchbacks, but most have wider sweeping turns, if any. Vail Pass, the major throughway into the central Rocky Mountains, has zero. The Rocky Mountains, though higher altitude, are also less steep than the Alps, Dolomites, or Pyrénées due to being much older. Switchbacks are one of the reasons that cycling in Europe is oh so much fun! How do you teach switchbacks indoors? When I created my first Rolling Hills and Switchbacks workshop back in 2002, I only recommended one way to teach them, describing them as irregular “jumps on a hill,” alternating seated with standing climbs. But not all real switchbacks are created equal. The geography of the mountain along with the engineering used to design and build the road determines how many, how tight, and how steep the switchbacks will be. I like to say that Mother Nature defines our switchbacks for us. You can have a lot of fun with cueing various ways to take on a hairpin turn. In part 1, I’ll provide some general advice that can be applied to all switchbacks, as well as tips on using the music to help define your switchback. In part 2, I’ll give you five different scenarios to describe and ride a switchback on a stationary bicycle. Mix and match them as desired. You can call these “drills” if you want, but the idea is that you can put them into any profile where you plan to go uphill. This is not your typical “Obsessed with Cycling Drills.” I’m going to dive very deep into this topic and bring the outside inside for you with lots of ideas. Personally, I don’t call switchbacks drills —it’s just one of many ways I coach climbing to make it more interesting. But I know some instructors refer to them as a drill. First, remember that this is all purely visualization—through your creative words and description of what the road looks like, you are giving your riders visual motivation. Indoors, we never really go uphill; it’s just an increase in resistance. Your vivid description is what turns it into a switchback and renders your ride more exciting and engaging. In part 2, we will look at five different scenarios for teaching switchbacks. I think this series is an ICA gem. I am learning a ton and cannot wait to coach my climbs with more variety!